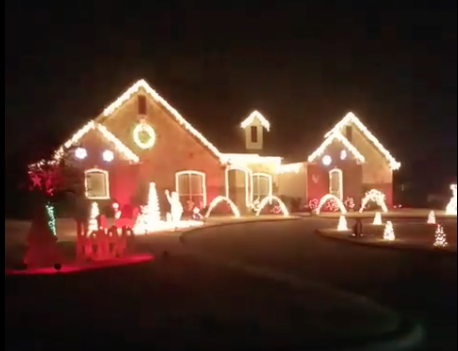 The winning home 1212 Artesia Lane, located in the Brushy Creek subdivision of McLendon-Chisholm was decorated by owners Gordon H. Varney and Stephanie Sealey. Turn on the sound to watch the light show. A yard sign listed what channel to turn your radio to. It was a real treat to watch all of the lights dazzle with the beat of the music. Fun decorations adorned the landscape and lighting displays really worked with the theme. The first runner-up was 14 Dancing Waters, located in Chisholm Crossing. The second runner-up was 1224 Manchester Drive, located in Kingsbridge. Thanks to all of the citizens who nominated the 8 nominees and who helped City Council vote! To watch the other nominations please visit our Facebook Fan Page. Next year, it would be great to see an increase in a number of nominations to expand to a variety of fun categories. I believe holiday lighting contests used to be a fun community activity in the past that many enjoyed. We hope to carry on the tradition if not spearheaded by the City Council or by a future Light War Committee membered by citizen volunteers. Please go out with your families and visit the neighborhoods to view all of the wonderful lighting displays. There is a lot of homes with outstanding decorations and who sure show off their holiday spirit.